I've said it before, and I'll say it again; vending machines are the ultimate business of convenience. And as long as people keep developing the technology and making them available on the market; we'll never see an end to the type of products that are dispensed. The latest vending machine will conveniently dispense a fashion product that everyone needs. 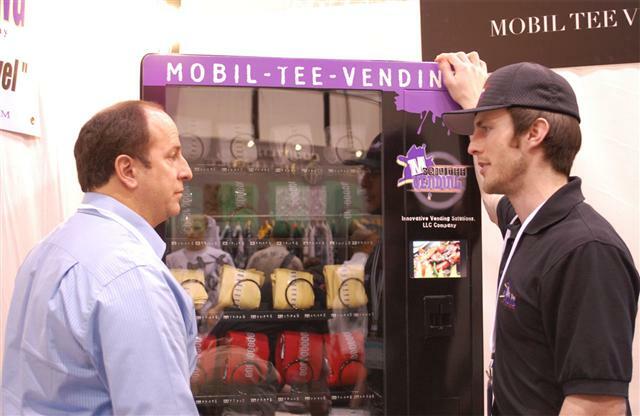 The Mobil Tee Vending Machines is designed to dispense 210 t-shirts. This variety of vending machine is available for purchase or lease, and can be filled with any t-shirt inventory that the retail store or investor wants to put in it. They accept cash, credit card and debit, and really, the only thing that could make this cooler would be if it did custom airbrushing or graphic images on demand! The vending technology and the companies behind it might not be the most interesting part of the convenient dispensing industry, but without them, there would be no businesses that bring the ultimate convenience that vending does! o Keys to Rental Cars? o Celphones etc IE have Drop in Module for Old Phone & then Recieve New Phone after Unit scans old Phone. o Toliteries in 1 bag. o Hotel room keys with your credit card as Proof U reserved your Room. Some above FREE, some fee. The Rental car keys alone can save Rental Co personnel etc since one shows ID barcode for Car, one scans Barcode & gets those Keys. All car makes & models. I think this is a wonderful idea...I have a small retail store and sell novelty items and licensed t-shirts, I think this is a great way for me to expand while keeping my overhead and expenses very low to almost none. I actually checked out their website and spoke with a nice guy by the name of Jeff. He really answered my questions and responded back in a timely manner. I am actually considering this venture, and if I hadn't stumbled upon it here I would have never known.